Bilbao is the capital of Vizcaya in the Basque Country, Spain. It's located on the edge of the Nervion, which is a tidal river, and the city is a pleasant and very walkable place to visit. There is a population of about 372,000 in the city proper and over one million in the metropolitan area. 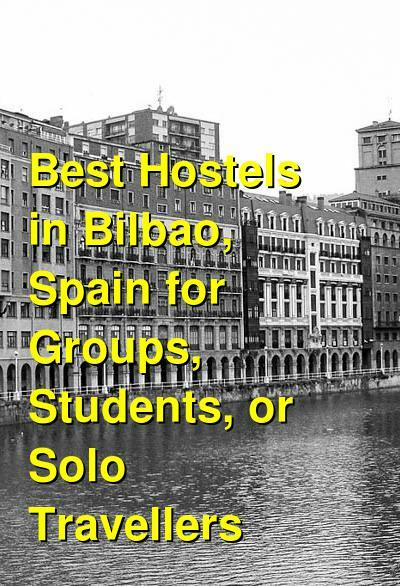 Bilbao has a handful of affordable hostels around town. Some have a more social setting while others are quiet and basic. If you're looking for an affordable place to stay then a hostel may be one of your best options in Bilbao. How much do hostels in Bilbao cost? A good hostel for students, solo travellers, backpackers, and groups. Bilbao Akelarre Hostel has been around since 2009. It has a total of 38 beds that are split between four, six, and twelve bed dorms. The hostel is a convenient place for students and school groups because it is close to the city's universities including Universidad de Deusto, Universidad del Pai Vasco, and Universidad de Sarriko. It's also about a twenty minute walk from the Guggenheim and is ten minutes from New Bilbao, which is where you'll find Euskalduna Palace, Iberdrola's Tower, Calatrava's Bridge, and more. The hostel provides breakfast between 8am and 10:30 am, which includes cereal, bread, croissants, muffins, chocolate, coffee, and tea. It's also possible to take the breakfast to go if you're planning to head out early to explore the city. This is a nice hostel that is clean and comfortable. It's a little removed from the city center, but it's easy to use public transportation to get anywhere you'd like to go. The staff is also helpful and friendly, and they can make all kinds of recommendations of things to do around town. Ganbara Hostel is another fun and modern place to stay in Bilbao, Spain. 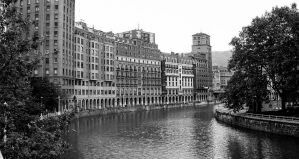 It's located in the Seven Streets area, which is right in heart of Bilbao's Old Town. It's one of the most conveniently located hostels if you want to explore the many museums and monuments around town. There are also many cultural activities that take place in the area and the hostel is not too far from the most active nightlife areas. This hostel has a wide range of amenities available for guests including free breakfast, air conditioning, bicycle rentals, security lockers, and free luggage storage. There are cooking facilities that guests can use and a common room that has a television, dvd collection, and video games. There's also laundry facilities available. The hostel has dorms that sleep either four or eight people. It has a social atmosphere and it is easy to meet other guests here. The staff is also friendly and social, and they keep the atmosphere light and fun. Pil Pil Hostel is a modern hostel that is located right in the heart of the city center. It's a short walk from many of the city's top attractions including the fine arts museum, San Mames, and Euskalduna Concert Hall. It's also just steps from a metro and tram station and the main bus station is a three minute walk away. The hostel has all of the standard amenities available including a complimentary breakfast buffet, tea and coffee throughout the day, and free wi-fi throughout the whole building. There is also a shared kitchen which guests can use and a bright backyard where many guests enjoy relaxing. The staff that works here is young and fun. They make sure that every guest is respected and comfortable, and you will quickly feel welcomed here. There is a fun and social atmosphere so it is not hard to meet other travelers. This hostel has dorms that sleep up to twelve people. There are female only and co-ed rooms available. Residencia Blas de Otero is a youth hostel that originally opened in 2004. It's a large place that has 216 beds in total. There are single rooms as well as a few twin and four bed rooms available. Every room has its own kitchen, a full bathroom, and central heating. Breakfast is available for an additional four euros. The rooms have basic furnishings including a wardrobe, desk, chair, and lamp. The kitchens have basic utensils and furnishings. The location of this hostel could be better, and it's not recommended that you walk around the neighborhood alone, particularly at night. If you're looking for an affordable place to stay, then this is a good choice, but the atmosphere is not as social as you would hope for at a youth hostel.